This luxurious holiday gite is in a stunning area of the Dordogne countryside with many beautiful local walks on our doorstep. Les Bardeaux Gite is at the end of a quiet little hamlet, within the Perigord Vert region of the Dordogne, but still close enough to enjoy local villages, towns and attractions, with our closest village just 3 and a half kms away, which offers a patisserie/boulangerie, post office, hairdressers, info site, pub, creperie and restaurant. Once a week (currently on Sundays) the pizza van comes too. Our nearest supermarket is just 15 minutes drive away. We are just 50 mins drive from Limoges airport. Set in gorgeous grounds, ideal for families and dogs, Les Bardeaux offers peace and tranquility and a chance to recharge your batteries. The ethos is all about enjoying nature: with our own woodlands, meadow, natural swimming pool, wood-fired hot-tub and hammock seats for you to enjoy. Les Bardeaux Gite is a very family-friendly place to stay. The gite itself has a child safety-gate at the top of the stairs, a baby bath, changing mat, cot, high chair and play-pen. There is an outside play area, with a swing/rope apparatus and a slide; and also games provided: boules (petanque), tennis, badminton, football, basketball, a mini ride-on toy tractor (pedal) and table-tennis. There is a natural swimming pool, with a shallow paddling area for young children. It is a really beautiful to look at and to swim in. Because it is a natural pool, the liner can be slippery, so guests may wish to bring rubber beach shoes. Lots of wildlife is attracted to the pool, including a resident kingfisher (there are no fish in the pool), dragonflies, frogs and newts. The wood-fired hot-tub is very popular, which is lit at night with solar fairy lights. I provide the wood for guests to light the stove and heat the water. (Children must be supervised at all times by an adult for the pool and hot-tub). There are a variety of bikes for guests to use for free, including a baby seat and a bike with stabilisers, although you will need to bring your own cycle helmets. The woods and the grounds here are a natural children's playground and children love the tractor and the quad bike! My hens are always extremely popular with children and I love it if they want to join me to feed them by hand and help collect the eggs. I have my own very friendly and loveable cocker spaniels, Molly and Diesel. They love people and other dogs and are always full of enthusiasm and energy. I understand how difficult it can be to find truly dog-friendly accommodation and whole-heartedly welcome your dog/s to Les Bardeaux Gite. We are spoilt for choice for walks right on our doorstep and have 7 and a half acres of woodland and meadows for you to exercise your dog in. If you need a dog-sitter or dog-walker then I am always very willing to help, if I can. We can also provide a dog crate and/or doggy blankets. I love nature and am trying to be as eco-friendly as I can. I recycle as much as possible and encourage guests to do the same; grow my own organic fruit and vegetables and keep free-range hens for lovely fresh eggs, all of which guests can buy when available; There is a wood-burning hot-tub for guests and a natural swimming pool. I do not need to use chemicals in the hot-tub or the natural swimming pool, so it is so much kinder on your skin and feels so much nicer to bathe in. The area around Les Bardeaux is breath-taking. There are countless walks right on our doorstep, through woods and hamlets, around lakes and meadows. It is paradise for ramblers, nature lovers, dog-walkers and cycling. The nearest village, Abjat-sur-Bandiat, is just 3 and a half kms away. It is possible to walk there along the walking tracks and takes about 45 minutes. If you're not feeling that energetic, it is just a few minutes in the car, or a short cycle ride away. La Ferme du Lac is a lovely 17th century restored farmhouse bar/restaurant nestles at the bottom of a wooded valley with its own lake. It’s a lovely place for relaxing over a drink in the sunshine. It is possible to walk there along the footpaths, taking about 45 mins. It is just a few minutes’ drive away, or you can cycle there. Les Bardeaux is in the Perigord Vert (Green Perigord) region of the Dordogne where there are countless outdoor activities, towns/villages, historical buildings/chateaux and caves, and swimming lakes to visit. We both love France, in particular the Perigord Vert region of the Dordogne, because it is less busy and touristy and, in our opinion, more lush and beautiful. We used to love our caravanning holidays in the Dordogne. Everything is easy to get to and close by: you don't have to exhaust yourself driving for hours to see places, which we've done in the past on holidays. The weather is a huge plus, as the summers are long, and lovely and hot. One momentous day (over a bottle of red wine) we decided that we would do it - start 'living the dream' and living life. Les Bardeaux was the very first house we looked at and we fell in love with it. We looked at another 30 properties, but nothing matched up to it. It had everything we wanted for our gite business: a high quality gite, which was ideal as a luxurious rural retreat; lots of land, including beautiful woodland; close to lots of attractions and stunning places to visit nearby; a nearby village with handy amenities, such as a boulangerie/patisserie; lots of fantastic walks on our doorstep; and quiet and peaceful! We hope that Les Bardeaux and its gite reflect a true love of nature and that our guests enjoy it as much as we do. We are trying to be as eco-friendly as we can: hence the wood-fired hot-tub and natural swimming pool. We have designed the pool so that it is family-friendly, with a shallow paddling area for very young children. The hot-tub is absolutely fantastic - it's such a natural experience and there is nothing so lovely as relaxing in it, gazing up at the stars (which can be incredible out here), surrounded by solar fairy lights and candle-light. The hammock chairs, by the hot-tub and in the woods, are so relaxing and comfortable: it is easy to lose a few hours chilling out with a good book. ​ Our woods and meadows are ideal for a dog-friendly get-away and there are so many walks right on our door-step for you and your dog to enjoy. We want to make guests feel like this is a home from home. ​ We also grow our own organic fruit and vegetables as well has keeping hens for lovely fresh eggs, and Tracy makes her own jams, pickles and chutneys. Whenever possible we offer our produce to our guests to buy. Wood-fired stove for heating. Wood provided. The living room is part of an open-plan living/dining/kitchen area. It seats 4 people. We provide 'starter' salt, pepper, cooking oil, washing-up liquid, dishwasher tablets, tea, coffee, sugar, rubbish bags. The tv is connected to a dvd player. There are a few dvds for guests to use. We have 7 and a half acres of grounds, including meadow and woodland, and gardens for guests to enjoy. Free use of basic bicycles, but guests need to provide their own safety equipment, i.e. helmets. We have a baby seat that fixes to the back of the bikes. We have a net, rackets and balls for guests to use, in the garden area. There is no actual tennis court. There is an in-ground natural swimming pool. 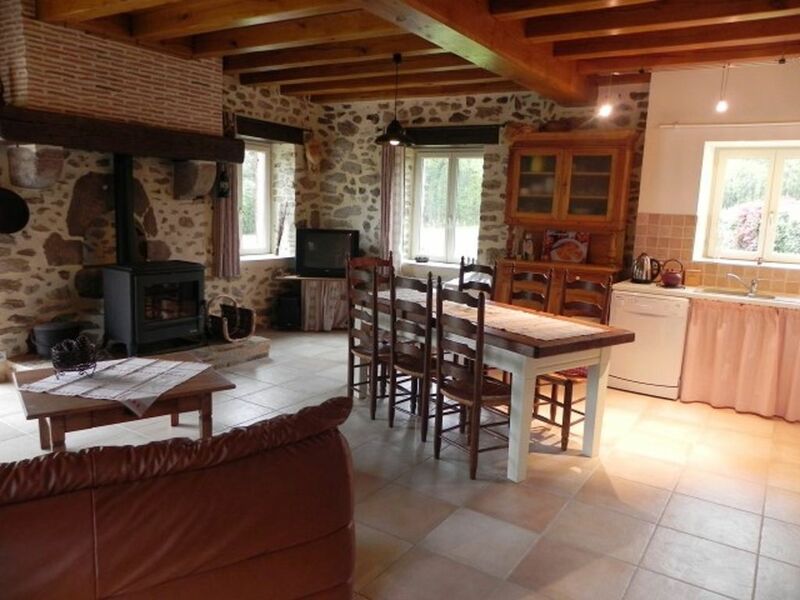 Lovely gite in a small hamlet, surrounded by woodland and walks. Tracey, the owner was very helpful and friendly. The natural swimming pool was just beautiful. The local village has an artisan baker, a bar and a restaurant. The owners have provided everything u would need and more.Fantastic condition clean and tidy, Tracy and Rob go out of their way to ensure you have a great time nothing is too much trouble. The natural pool is a fantastic new addition. Absolutely fantastic guests! So friendly and lovely; they were a complete pleasure to have to stay. The care and consideration they took with the gite was wonderful. They left the gite spotless! We highly recommend them.